A couple of years after pitching the idea of adding one toll lane in each direction, highway officials are now talking about adding two lanes with MoPac-style variable tolls to each side of I-35 from Round Rock to Buda and channeling those lanes well below ground level through much of Central Austin. Texas officials are doubling down — way down — on their plans to add toll lanes to Interstate 35 through Austin. That long-range plan, announced Oct. 30, would include eliminating the upper deck that runs between Martin Luther King Jr. and Airport boulevards, replacing those two free lanes on each side with added freeway lanes tucked under the frontage lanes. The next level down would contain the toll lanes. This complex three-level design through Austin's core, which officials have dubbed the Capital Express, would be similar to what the Texas Department of Transportation did recently with Interstate 635 in Dallas. Drivers in the lower level are not in a tunnel, but in the bottom of a double-decker road with strips of light cutting through the median. And it would be very expensive: $8.1 billion for 33 miles from RM 1431 in Williamson County to Texas 45 Southeast near the Hays County line. The concept, to squeeze what amounts to 12 expressway lanes into a narrow Central Austin corridor bordered by cemeteries, hospitals, hotels and office buildings, would involve tucking some lanes under those above them in what TxDOT calls a “cantilever” approach. To the north and south of Central Austin — where TxDOT owns broader strips of land along the highway — the design probably would include just one or two levels, with the new toll lanes and reconfigured free lanes at the same elevation. The plan, as contemplated now, would not include adding free lanes, said Terry McCoy, TxDOT's Austin district engineer. This hyperambitious expansion of what was already a $4.3 billion plan for I-35, a 2015 vision with just one toll express lane on each side and added free lanes in some places, has emerged in part because the Texas Transportation Commission has signaled that it remains open to funding “managed lanes.” Such lanes, like the newly built toll lanes on MoPac Boulevard (Loop 1), have tolls that rise and fall as the lane gets more or less crowded, ensuring that traffic keeps moving. 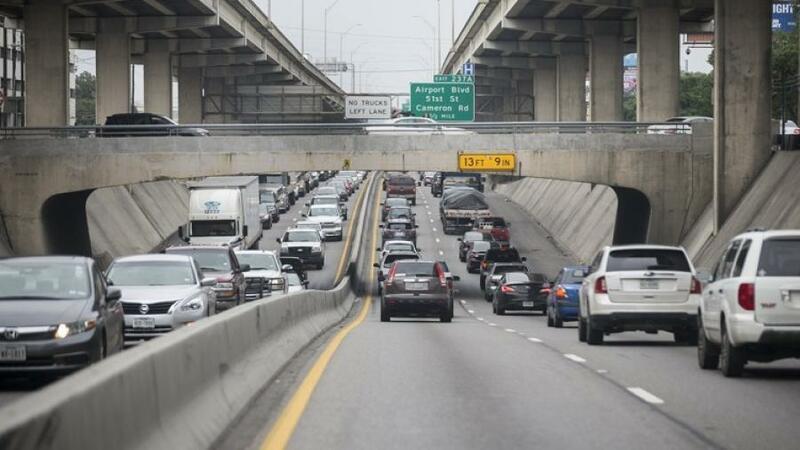 If local community leaders say they want TxDOT to build lanes with variable tolls as a means to combat congestion and provide faster lanes for transit buses, “the commission will consider that,” Chairman Bruce Bugg said at a commission meeting last week. And TxDOT officials last week specifically indicated that they are willing to devote more agency dollars to major projects in the state's largest metropolitan areas, even if tolls are involved. Of a list of 16 such projects statewide laid out in that commission work session, 14 involved adding lanes with variable tolls. That would seem to be a shift from Gov. Greg Abbott's stance, from his 2014 campaign and speeches since then, of addressing the state's highway needs without raising taxes or imposing more tolls. That would be possible, he said, because of the added $4 billion a year or more generated for TxDOT through reallocations of existing taxes approved by voters and the Legislature in 2014 and 2015. But TxDOT officials and some commission members have said over the past year or so that even that ample flow of new money is not enough to pay for megaprojects on expressways in the state's largest cities. Abbott appointed three of the commission's five members and recently elevated Bugg, a San Antonio bank executive, to the chairman's post. Kirk Watson, Austin's longtime state senator, said Oct. 30, that he supports the I-35 toll lane concept because of what it could do for transit as well as individual drivers. He said it is important to go big with two toll lanes a side even with the greater cost. “You're only going to do this through downtown Austin once in my lifetime, and the lifetime of my grandchild,” he said. Watson and McCoy both said there is no specific plan at this point for ginning up the money for all 33 miles. Rather, they said, the point is to put I-35 in position to be ready for funding as the commission allocates it or as toll-backed borrowing occurs. To that end, McCoy said three ongoing environmental studies for the north, central and south sections of I-35 through Central Texas will be combined into a single review for the entire 33 miles. That omnibus study will center on a design that would have two variable toll lanes on each side. That $20 million study, using the three engineering consulting companies that were already reviewing I-35, should be done by the end of 2019, McCoy said. Construction, when money can be found and attached to the project, almost surely would begin in the center of Austin.